Rockstar Energy Suzuki Europe’s Jeremy Seewer maintained his eye-catching speed and potential in the MX2 class of the FIM Motocross World Championship by scoring third position overall at a sweltering Uddevalla for the Grand Prix of Sweden. Round 11 of 18 in the series was played out in front of a 22,000 audience and in summer conditions as sunshine and high temperatures blessed the visit to Scandinavia. For Seewer there were several small milestones. His ranking represented a third podium appearance of 2015, his second moto second position was a career-high to-date and he also notched a second holeshot of the season in the same outing. Uddevalla was a particular taste with loose, fine soil disguising a hard base and often-slippery terrain. The narrow course was tight and undulating and frequently dusty. Once more a good start and shrewd first lap was essential for maximum points and some ill-advised watering did not make things any easier for the MX2 collective. Seewer placed his works RM-Z250 fifth into the start gate for the first moto and rounded the first lap in the same slot. After a small crash the Swiss was then sucked into a tussle with Brent Van Doninck and Vsevolod Brylyakov from which he was able to earn seventh place by the chequered flag, less than one second behind the Belgian. In the second moto ‘#91’ gained the Fox Holeshot Award and led the world for two laps. Although he could not do anything about Tim Gajser he was able to reel off 18 laps ahead of world champion Jordi Tixier to finish second. Seewer has moved up to fourth in the MX2 Championship standings and is just 23 points from the top-three in only his second full Grand Prix season and first as full-time Pro. Round six of nine in the EMX250 European Championship saw the talents of Brian Hsu and the potential of Bas Vaessen in action with their RM-Z250s. Hsu gated well and rode with gusto to record a 3-3 and take his second podium finish in a row. The first moto took place on Saturday afternoon and thanks to another vibrant start Hsu slotted straight into a top-five position. The teenager and former World Champ on two-stroke machinery was able to grade third after leader Nick Kouwenberg made a mistake and secure his second ‘podium’ classification in a row after breaching the winner’s circle for the first time in Germany two weeks ago. Vaessen rode to 23rd place and just missed out on the points. On Sunday morning Hsu again drilled his distinctive yellow RM-Z into the front group around the opening curve. He could not catch Kouwenberg but had enough speed to remain clear of Adam Sterry for another third spot. With 21st position Vaessen again was agonisingly-close to collecting points. In the European Championship points table Hsu has 131 and occupies seventh place; he is only 14 points from fifth. Vaessen, also in a learning term at this level, is 23rd. Like the rest of the Suzuki crew the Rockstar Energy Europe team will now contemplate the demands of the Kegums circuit close to Riga. The Grand Prix of Latvia next weekend could provide another hard-pack test or with ample watering could become rough and sandy. EMX250 is also in action once more. MX2 Moto1: 1. Jeffrey Herlings (NED, KTM), 35:10.178; 2. Tim Gajser (SLO, Honda), +0:07.770; 3. Valentin Guillod (SUI, Yamaha), +0:14.010; 4. Pauls Jonass (LAT, KTM), +0:21.869; 5. Vsevolod Brylyakov (RUS, Honda), +0:23.943; 6. Brent Van doninck (BEL, Yamaha), +0:25.324; 7. Jeremy Seewer (SUI, Rockstar Energy Suzuki), +0:26.261; 8. Brian Bogers (NED, KTM), +0:52.897; 9. Ivo Monticelli (ITA, KTM), +0:57.424; 10. Jorge Zaragoza (ESP, Honda), +1:03.012. MX2 Moto2: 1. Tim Gajser (SLO, Honda), 34:10.850; 2. Jeremy Seewer (SUI, Rockstar Energy Suzuki), +0:02.097; 3. Jordi Tixier (FRA, Kawasaki), +0:02.758; 4. Valentin Guillod (SUI, Yamaha), +0:18.776; 5. Vsevolod Brylyakov (RUS, Honda), +0:19.725; 6. Julien Lieber (BEL, Yamaha), +0:22.466; 7. Max Anstie (GBR, Kawasaki), +0:38.816; 8. Brian Bogers (NED, KTM), +0:40.653; 9. Roberts Justs (LAT, KTM), +0:48.374; 10. Benoit Paturel (FRA, Yamaha), +0:49.537. MX2 Overall Result: 1. Tim Gajser (SLO, HON), 47 points; 2. Valentin Guillod (SUI, YAM), 38 p.; 3. Jeremy Seewer (SUI, Rockstar Energy Suzuki), 36 p.; 4. Vsevolod Brylyakov (RUS, HON), 32 p.; 5. Brian Bogers (NED, KTM), 26 p.; 6. Brent Van doninck (BEL, YAM), 25 p.; 7. Jeffrey Herlings (NED, KTM), 25 p.; 8. Roberts Justs (LAT, KTM), 22 p.; 9. Jordi Tixier (FRA, KAW), 20 p.; 10. Benoit Paturel (FRA, YAM), 20 p.
MX2 World Championship Standings (after 11 of 18 rounds): 1. Jeffrey Herlings (NED, KTM), 423 points; 2. Tim Gajser (SLO, HON), 345 p.; 3. Valentin Guillod (SUI, YAM), 335 p.; 4. Jeremy Seewer (SUI, Rockstar Energy Suzuki), 311 p.; 5. Pauls Jonass (LAT, KTM), 307 p.; 6. Jordi Tixier (FRA, KAW), 306 p.; 7. Max Anstie (GBR, KAW), 262 p.; 8. Julien Lieber (BEL, YAM), 259 p.; 9. Aleksandr Tonkov (RUS, HUS), 256 p.; 10. Dylan Ferrandis (FRA, KAW), 205 p.
EMX250 Overall Result: 1. Maxime Desprey (FRA, KAW), 47 points; 2. Nick Kouwenberg (NED, HON), 40 p.; 3. Brian Hsu (GER, Rockstar Energy Suzuki), 40 p.; 4. Ander Valentin (ESP, YAM), 31 p.; 5. Adam Sterry (GBR, KTM), 30 p.; 6. Ken Bengtsson (SWE, KTM), 26 p.; 7. Damon Graulus (BEL, YAM), 25 p.; 8. Pontus Jönsson (SWE, HUS), 22 p.; 9. Frederik van der Vlist (NED, KAW), 19 p.; 10. Simone Zecchina (ITA, KAW), 19 p.; 28. 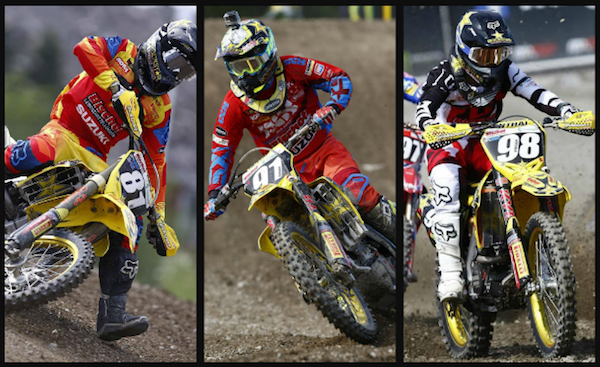 Bas Vaessen (NED, Rockstar Energy Suzuki), 0 p.
EMX250 European Championship Standings (after 6 of 9 rounds): 1. Nick Kouwenberg (NED, HON), 219 points; 2. Maxime Desprey (FRA, KAW), 217 p.; 3. Adam Sterry (GBR, KTM), 200 p.; 4. Damon Graulus (BEL, YAM), 197 p.; 5. Ander Valentin (ESP, YAM), 145 p.; 6. Alvin Östlund (SWE, YAM), 132 p.; 7. Brian Hsu (GER, Rockstar Energy Suzuki), 131 p.; 8. Steven Clarke (GBR, HUS), 118 p.; 9. Simone Zecchina (ITA, KAW), 98 p.; 10. Nicolas Dercourt (FRA, KAW), 96 p.; 23. Bas Vaessen (NED, Rockstar Energy Suzuki), 34 p.